Marguerite Vardman has been singing since she was old enough to speak. She was blessed to have a mother who was a Big Band singer in her younger years, then participated in church music and musical theater for the rest of her life. She loves to tell this story: “Mom taught me how to sing when I was barely 2 years old. One of my favorite songs was ‘You Are My Sunshine’, because my Nanna would sing it with me, whenever I visited her house. By the time I was 6, I had memorized all the Broadway Show Tunes on Dad’s record albums. So I was required to perform them for our friends and family, whenever they came to dinner! After graduating from Northeastern University in 1976, Marguerite continued to perform with their Choral Society and Madrigal group for several more years. The soon-to-be Director of the Boston Lyric Opera Company, Janice Mancini Del Sesto, was her voice teacher until she relocated the South in 1983. In Atlanta, she studied with Sue Williams at Kennesaw State University. Over the years, Miss Vardman has also performed with Boston Symphony Orchestra, Concerts in Black and White Orchestra, Robert Shaw and the Atlanta Symphony Orchestra, and Susanville Symphony Orchestra. She, and her daughter Julie Anoush (who is named after Julie Andrews), sang gospel choir background vocals for Michael Bolton at Lakewood Amphitheater in 1994; and later performed with the Metro Atlanta Gospel Choir for the 1996 Special Olympics. In 1999, she collaborated with Kurt Beals of Atlanta to produce an original CD of contemporary church music, entitled “Starting*Today”. 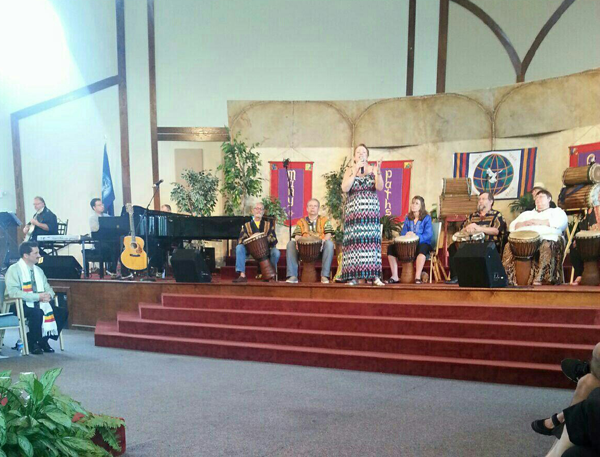 To date, Miss Vardman has been a soloist at over 50 churches across North America. She is available to perform at birthday and anniversary celebrations, weddings, memorial services, professional sporting events, etc. To schedule Marguerite as a soloist, please visit the Contact page on this website. Please include a contact name; the name of your church, spiritual center, or organization; the date/time of the event, and a contact number.